2. For the post of UDA, candidate must have served as UDA or rendered more than 5 (five) years of service as Lower Divisional Assistant in any District Court or Sub-Divisional Court as on 01.03.2018. Candidate having knowledge in computer shall be preferred. 3. 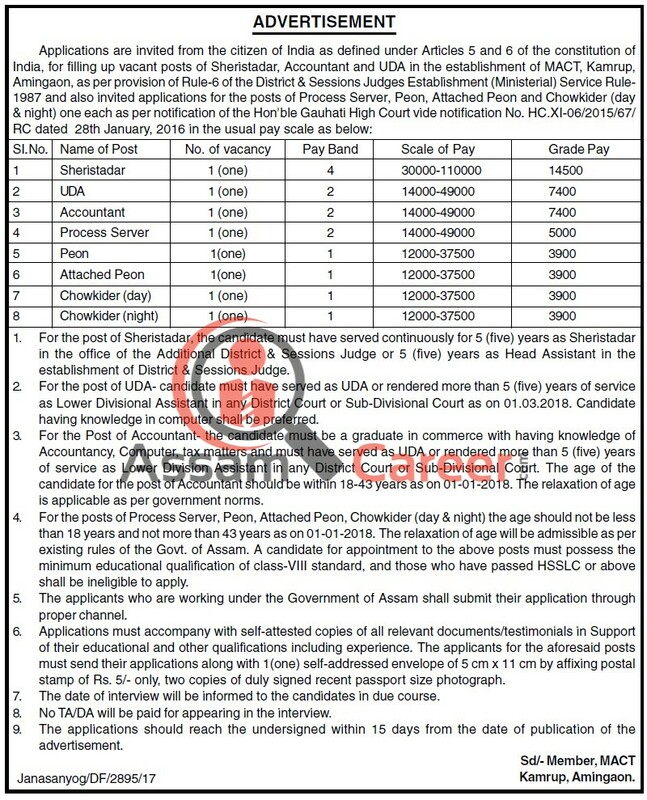 For the Post of Accountant, the candidate must be a graduate in commerce with having knowledge of Accountancy, Computer, tax matters and must have served as UDA or rendered more than 5 (five) years of service as Lower Division Assistant in any District Court or Sub-Divisional Court. 4. For the posts of Process Server, Peon, Attached Peon, Chowkider (day & night) one must possess the minimum educational qualification of class-VIII standard, and those who have passed HSSLC or above shall be ineligible to apply. Age: For the posts of Process Server, Peon, Attached Peon, Chowkider (day & night) the age should not be less than 18 years and not more than 43 years as on 01-01-2018. The relaxation of age will be admissible as per existing rules of the Govt. of Assam. The applications should reach the Member, MACT, Kamrup, Amingaon within 15 days from the date of publication of the advertisement.